"Near convenience stores & restaurants in the village of Onna..."
Have a question for Kanehide Onna Marine View Palace? "Very spacious and staff are efficient." "Easy to find because hotel is high, room also nice!" "The room is super big!" When visiting Okinawa, you'll feel right at home at Kanehide Onna Marine View Palace, which offers quality accommodation and great service. Set from the excitement of the city, this 3-star hotel commands an excellent location and provides access to the city's biggest attractions. 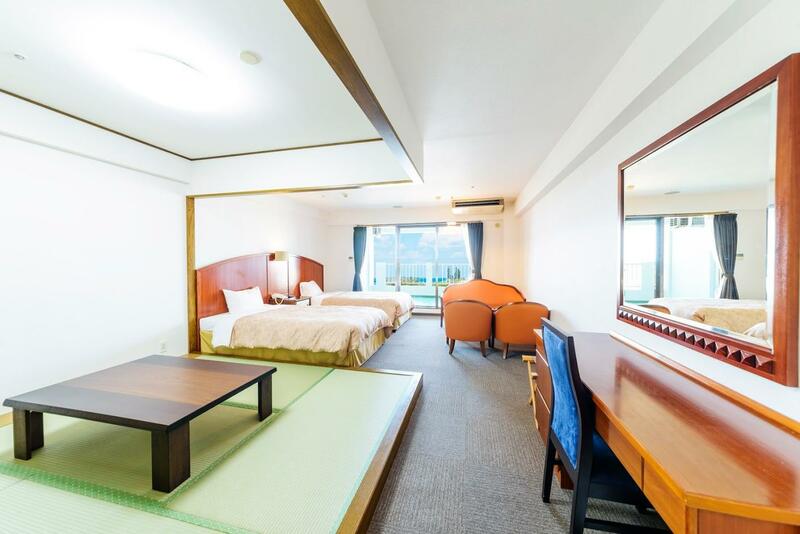 This modern hotel is in the vicinity of popular city attractions such as Sun Marina Beach, Bios Hill, Ryukyumura Theme Park. 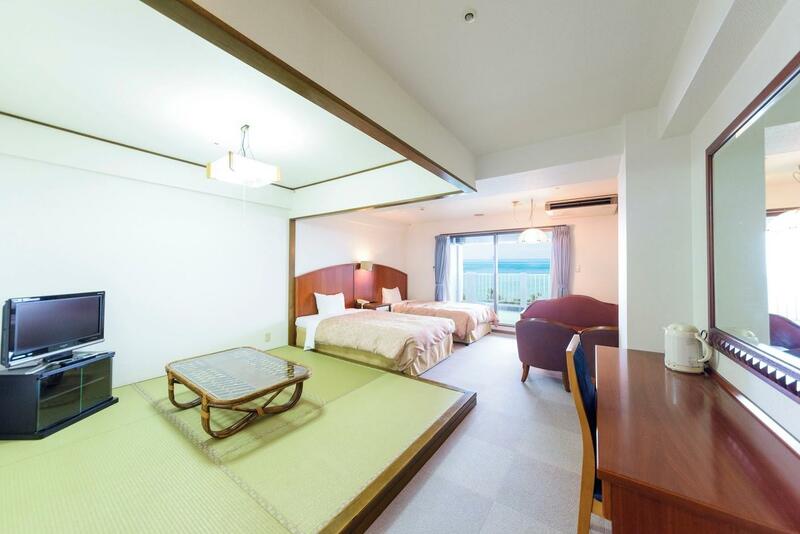 Kanehide Onna Marine View Palace also offers many facilities to enrich your stay in Okinawa. While lodging at this wonderful property, guests can enjoy free Wi-Fi in all rooms, convenience store, daily housekeeping, gift/souvenir shop, laundromat. Hotel accommodations have been carefully appointed to the highest degree of comfort and convenience. In some of the rooms, guests can find television LCD/plasma screen, mirror, slippers, sofa, television in bathroom. The hotel's golf course (within 3 km), outdoor pool, indoor pool, spa, kids club are ideal places to relax and unwind after a busy day. Whatever your purpose of visit, Kanehide Onna Marine View Palace is an excellent choice for your stay in Okinawa. "Overall, this hotel is designed like a service apartment min..."
Please note that the beach swimming season is from April to September. Near Moon Beach & a short walk from Tiger Beach. Ocean view & large balcony. Breakfast buffet had a good selection. Tried the izakaya one evening but wouldn't recommend - not much atmosphere nor range of options; should have gone for the dinner buffet in the next room. Large, comfortable room. Stayed a total of 4 days at this hotel. Exterior look of the hotel seems quite new but the interior of the room seems to be a bit old but quite clean. 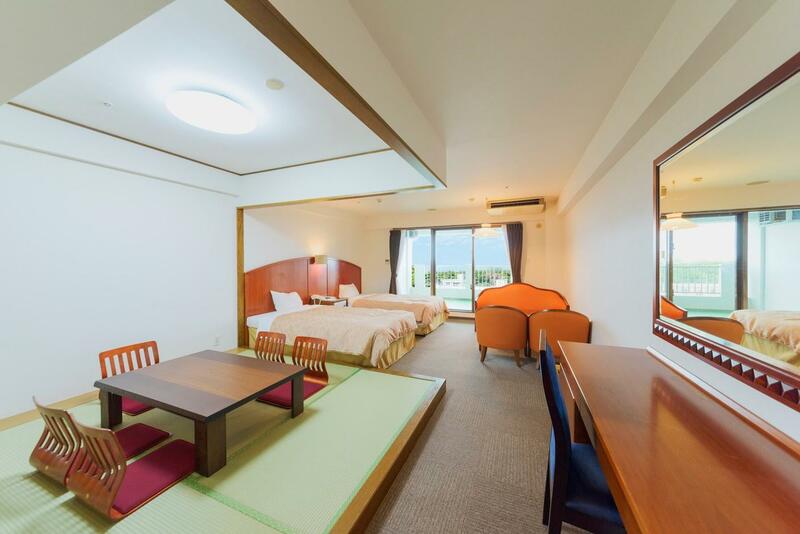 Though we have booked low floor with 3 tatami and 2 beds, but they have given us the high floor (level 11) which allow us to have unobstructed view of the ocean and the nearby surroundings even though we are a distance away from the beach. Just opposite and both sides of the hotel (after walking out and down a slope), there are many eateries, convenient stores and even boutiques. Overall, this hotel is designed like a service apartment minus out the plates, pans and washing machines. Balcony is also included where you can sun your clothes or doing exercises under the cooling air. The hotel is located in the vicinity of eateries and convenient shop, oversee the beautiful sea and also is very spacious. It is value for money, The buffet spread is also very good. I enjoy the stay in the hotel. The room is super big! u can see the ocean from the balcony. The restaurant is on the 15/f, with a beautiful sea view. The free breakfast was very nice ! Stayed at high floor, the view is nice! Breakfast was good! Car park slot is ample, otherwise you can park in front of the hotel. There are some restaurants nearby the hotel. Lawson is just within walkable distance, super convenient. We’ll definitely stay at Maine view palace if we go to Okinawa again! Pros: 1) Very spacious room 2) Easy access to many beaches and sightseeing places. 3) Staffs are friendly 4) Breakfast is good 5) Parking is free Cons: 1) Laundry facility is not good 2) Rooms are little bit old Overall I would recommend this property and I will stay there if I go to Okinawa again. I stayed in this hotel for 3 nights Good things: The room is big, nice breakfast and free parking. Things you need to aware: Please use the outdoor parking area if you come with a MPV or 7 seaters. Their indoor parking only fit for small car. The hotel is good. The room is clean and quite big. I like the breakfast buffet, that is very Japanese style. There is a convenience store in just 3 minutes walk. Location is great. But the staff barely speak English. It may be a problem. Got nice parking and friendly service. Room is big. Stayed in December which is the down month in Onna since beaches are all closed and their outdoor pool closed. Hotel looks dated but room is big and comfortable plus came with small kitchen but wifi was weak. I noted on the check-in card that it stated they don't have room service but I didn't face any issues to really confirm this. Breakfast is at top floor with great view and wide variety which was good. Location is on hill so up-slope walk is needed but it is near eateries and a convenience store at foot of the hill. View is Good, Hotel is tidy and clean, staff is helpful. My second time stay in this hotel, but get approved. Last year , the English speaking standard of the staff is bad, and this year approved a lot. Last year, there is no wifi in room, and this time, every room get free wifi, so amazing ! Very smelly room, no non-smoking room for selection. No wifi, facilities look really old and the small room isnt comfy. Totally overpriced. Not a decent stay. only good thing is free parking. Staff's english is poor, luckily i did speak some japanese. Big spacious rooms. There is free coffee tea dispenser at the 1st floor. Staffs were grumpy and spoke little english. View not bad when have breakfast. The room is very nice and clean. We feel surprise that can see the sea view.